Labor Day. A little rain. A holiday. With shock I realize these are all dead frogs. All over the road. Dead frogs. Run over, dead frogs. Bits and pieces of frog, here and there, scattered about, all about. Hardly recognizable as frog. Heck, not at all recognizable until I see one with enough of its frog form remaining to suggest: frog. Enough to know: dead frogs. Even though I have never seen a frog hopping across the road. Am sure I never ran over one. Yet here they are. Smashed dead frogs. All over the road. Later, back at the investigator’s, I see a big marvelous snake in the middle of the road smashed flat, a divine curlicue. And that mysterious knock somewhere near the front driver side tire of the van remains mysterious. Rain. I spend some time rearranging the loft, one-third of it or so, the desk space, the work space, the space where this winter—I have decided it is time—I will work on and write my magnum opus, Some Serious Writing. Yes, I have decided—it is time. No more fiddling around with typewriters, hand-typed books, weekly blog posts, all this flotsam and jetsam and such, just words, a dribble, a drabble. So. Step One. Rearrange desk and files and shelves and stuff. Very Important. Once Again. Josie keeps track of his bed as it has moved out from under the desk, gets shoved here and there. Elliott stays in a bed down below. Rain—no! Well, yes. But, then—cool, dry, northwest wind kicks in, blows in, blows hard, blows out. Puffy white seahorse clouds. What a wonder: blue sky. Candle, candle, think, rearrange, mow. Slow late afternoon soaking up sun, wind. Later, stars. Like an old friend, Orion strides across the southern morning sky. No rain but everything damp, condensation, dew, and after a bout with the lawn mower and wet grass I rest in front of my new favorite show, Wallander, the Swedish Wallander, Henning Mankell’s Wallander, and there is a knock on the door. A young man introduces himself as Kenyon, a pottery teacher at Finlandia University. 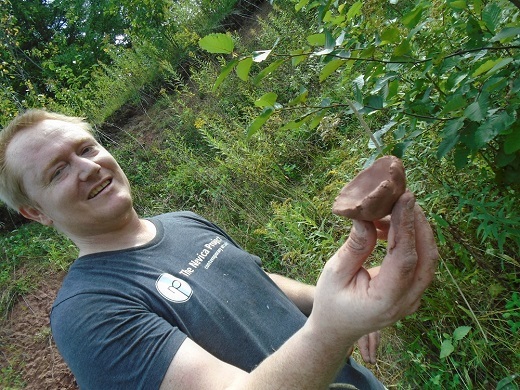 He tells me his students are filling buckets with red clay from the riverbank, my riverbank, he thinks, and is that OK? A minute to process, but then, sure, can I come see? So people just stop by, pull earthenware cups out of the riverbank. I am delighted to learn that the riverbank—this part that tends to lose a bit of itself each spring—is deep with “red earthenware ready-to-go plastic clay” (or something like that) and that somebody—a few somebodies, it seems—can make something of it. Perhaps I could make something of it. Pinch clumps of it into frogs. Coat the frogs with beeswax. Protect them as they cross the road, because beeswax is hydrophobic, and of course that makes no sense at all. If tomorrow’s forecast holds any truth, the farmers market will be rain rain and rain showers. Cloudy with periods of rain. Becoming windy for the afternoon. Thunder possible. High 62F. Winds NNW at 20 to 30 mph. Chance of rain 90%. We head out in a downpour, dark, headlights, a watery path through the dark, on through Pelkie, the bright lights of Pelkie, watery lights that somehow just make it seem all the darker, I drive more slowly than usual, the wipers swish back and forth, back and forth, brief sparkling beads of rain thrown into the night, out of sight, and Josie has settled into his co-pilot snooze. Past Pelkie a ghostly form, white and so small, so light, comes leaping out of the woods, into the headlights, onto the road, one big gangly hop from the right, the woods, the dark, into the light, and there’s my frog, there in my path. I catch my breath. Can do no more. What is your magnus opus going to be about? Cool about the clay! There is a lot of yellow clay around here, too, and there used to be a tile factory. You could make tiles with paw prints... :) I think you would love working with clay and so cool that it is right THERE. There for YOU! The m.o. is about my ancestors, the orphan train, religion, immigrants, natives, maybe a road trip ... see, I gotta get it organized! 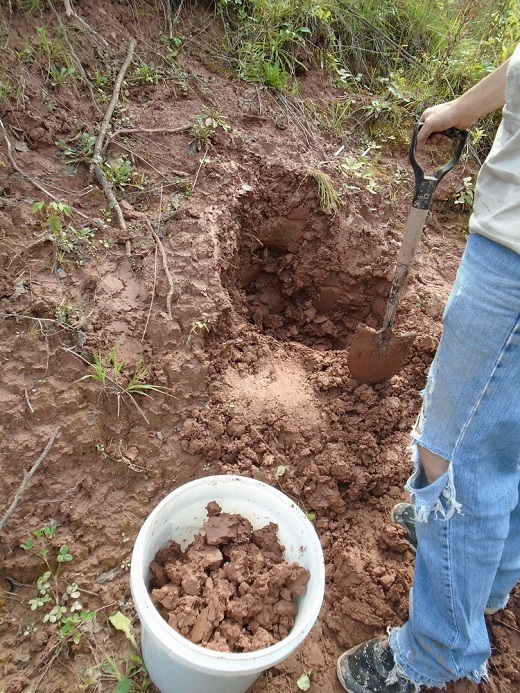 I need to go dig up a bucket of clay, bring it back to the cabin, see what happens. It does make me happy knowing it is out there. I thought it was probably my neighbor who stops by now and then, usually traveling on her bike. She has snuck up on Josie and me before! I was surprised when I opened the door and it was not her. This group had parked at the neighbor's house that is up on the road and walked back. Kenyon said he has canoed (or maybe kayaked) the river a few times -- that's how he knew the clay was there.